Million Dollar Pier in Atlantic City, NJ. During his time working for Pretzel, he was also exposed to other freelance artists, such as Howard Hewlitt, and was immediately inspired. 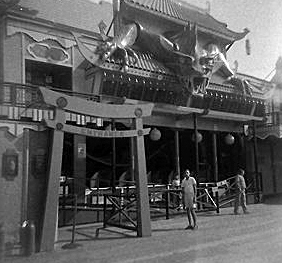 It is rumored that Howard Hewlitt is the artist who originally designed the Haunted House façade, which Bill often used and made famous. 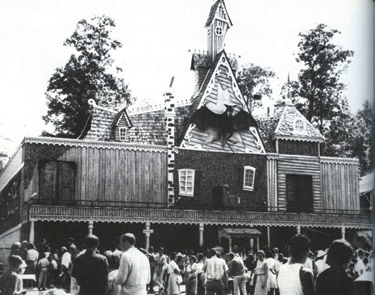 The Haunted House façade usually incorporated a roofline with multiple uneven peaks, crooked chimneys, uneven clapboard, crooked windows with shutters, and usually an enormous vampire bat. Whether or not Bill used Howard's idea, or perfected it, is of no significance. Every artist is influenced in some way or another by other artists and they use each others ideas as foundations to build off of. Bill Tracy had found his niche and the final phase of his illustrious professional career was now underway.